Lamers Motor Coach transfer to/from Green Bay, Appleton to/from Chicago O’Hare Airport. Nonstop flight on Swiss Air to Zurich, arriving Jan 19 and Motor Coach transfer to Ischgl. 7 nights lodging at the 4-star Hotels Yscla and Albona, daily breakfast and dinner nightly. 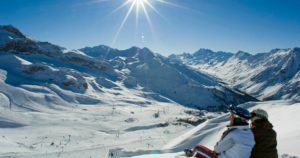 6 day lift pass for Ischgl, Austria & Samnaun, Switzerland 45 lifts, 150 miles of trails. Motor Coach transfer to Zurich Airport and Swiss Air flight to Budapest Saturday, Jan 26. Motor Coach transfer to Central Budapest. 3 nights lodging at the 4-star Hotel Opera, including daily breakfast. 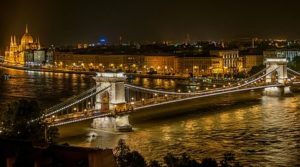 Motor Coach transfer to Budapest Airport and Lufthansa flight to Chicago Wednesday, Jan 29. Trip is open for signup on June 11, 2018. Initial deposit of $500 required. $50 is nonrefundable for any reason. Second payment of $1000 is due September 5, 2018. Full Trip Price: $3099, all prices are double occupancy. Deduct Lift Ticket: $300, If you intend to ski less than 5 days, purchase your ticket on a daily basis. Deduct Senior Lift: $30, If you were born before Jan 1, 1959. Deduct Budapest: $180, You will need to provide your own transportation from Chicago O’Hare and to Zurich airport. Deviations: $150, charge for alternate itineraries (stay-overs, alternate airports) plus any added airfare, only available before December 4, 2018. Trip is open for signup on June 11, 2018. Initial deposit of $500 required. $50 is nonrefundable for any reason. Second payment of $1000 is due September 5, 2018. Final balance is due November 15, 2018. While cancellation fees can be waived if a substitute can be found for the spot, there will be a minimum $50 cancellation fee plus any costs associated with the change. After airline tickets are issued on December 15, they are refundable less a $300 fee and non-changeable (no name changes allowed). This trip has been priced at an exchange rate of 1.00 Euro = $1.21US. While there is a contingency allowance built in to the trip, any extreme change in the rates could increase the cost of the trip which is the responsibility of the trip participants. If the exchange rate turns in our favor, added benefits will be included (parties, transport tickets, activities, etc). Adequate insurance in case of accidents, skier mountain evacuation, emergency medical treatment, and evacuation home, are recommended. An insurance package will be offered at additional cost, with options for trip cancellation coverage. A valid passport is required, and should have an expiration date no earlier than August 1, 2019 (6 months validity beyond the trip completion date). Due to the extra airline fees required for luggage of more than one checked item, and bus storage limitations, I STRONGLY recommend that you rent skis in Ischgl and leave yours at home. Membership in the Sly Fox Ski Club or the Gelandesprung Ski Club is a requirement to sign up. Yes, sign me up for the Ischgl trip. I have read the conditions stated above and agree to the terms. Note, put any deviations of the flight itinerary, alternate airports here and I will get back to you with a price.